Travertine is a low maintenance material used for outdoor building for thousands of years. The Romans used it for everything from fountains to the Colosseum. Using travertine pavers will give you decades of nonfading colour on a low erosion surface. This makes it a perfect choice for outdoor construction. Installation is a simple process, dry laying the stone in a bed of sand. You just set the pavers in place, fill the joints between with sand and enjoy your new patio. Please keep in mind following information is for educational purposes only. Always get professional help, and check with your city and county codes before starting a project. Mark the outline of your patio’s location, using a series of lawn flags placed around the perimeter. Using a spade, excavate the space between the flags to a depth of 6 inches, plus the height of your travertine pavers. To help with drainage, slope the base of the hole about 1 inch away from any structures for every 8 feet of length. Compress the floor of the excavation with a plate compactor. Run the compactor in overlapping rows along the base of the excavation to create a soil surface less prone to shifting. Rent a compactor from a home improvement store or equipment rental shop when necessary. Pour a layer of paver base, a combination of gravels of various sizes, into the base of the foundation about 2 inches deep. Compact the gravel with the plate compactor, then add an additional 2 inches. Compact the second layer, then add a final 1-inch layer, compressing it a third time to build a total gravel layer of about 4 inches. Add a bed of sand to the excavation above the gravel layer. Fill the hole with a layer 2 inches deep and then go over the sand with the plate compactor. Pour 2 more inches atop the first two and compress it as well to create a compact layer about 2 inches thick. Place the edging stones for your patio into the sand lining the edge of the excavation. Make sure the tops of the edgers are high enough to level out with the tops of the pavers according to paver thickness. Check the level of the edgers with a carpenter’s level across adjacent stones. Make height adjustments as needed. Simply tap the stones deeper into the sand with a rubber-headed mallet, or by adding sand beneath the edging stones. Lay the travertine pavers into the bed of sand, beginning at a corner of the patio excavation. Press the first paver firmly into the sand bedding, tapping it into place with a rubber mallet so it sinks about 1/4-inch into the sand. Lay the second paver tightly butted against the first, tapping it into place as well. Build outward from that corner, adding pavers in your desired pattern, using the bed of sand to maintain their position. Check the level of the pavers with a carpenter’s level across adjacent stones. Lower higher pavers against adjacent stones, tapping them deeper into the sand with the mallet. Raise low pavers by pulling them out and adding a bit of sand to the hole before replacing the paver with a tap of the rubber mallet. Cut the pavers when needed, scoring a cutline across the paver surface with a cold chisel and hammer. Score the line on all four sides of the paver so the cut will be clean all around. Place the scored paver onto a board with the line centred, then place the tip of the chisel across the scored line. Tap sharply on the chisel head with the hammer to break the paver along the scored line. Lay the cut paver in place where desired. 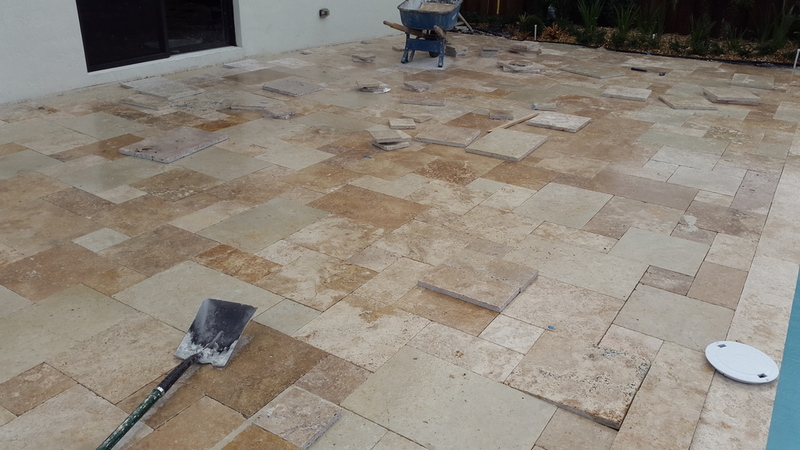 Fill the joints between the travertine pavers once you have set them all into place with sand. Pour sand across the surface of the pavers, then sweep it between the pavers with a broom until you have filled the paver joints. Fill any spaces between the pavers and the edging stones with the sand as well. Use a water hose to wet down the sand in the joints, driving it deeper. Allow the pavers to dry, then fill the joints further where the wet sand fell further downward. Repeat until the sand no longer falls deeper into the joints when watered. This entry was posted in Uncategorized and tagged How to install Travertine Pavers on sand, Travertine Paver installation. Travertine and Marble Tiles are often supplied wet. Here’s why. Comments Off on Travertine and Marble Tiles are often supplied wet. Here’s why.